Check out our full line of Card Cover designs here. 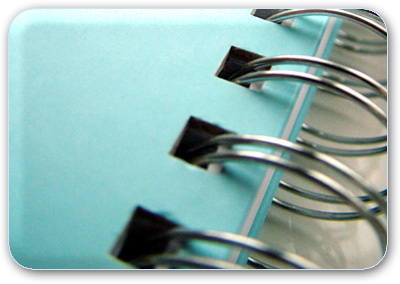 Promote your business with quarterly re-brandable booklets. 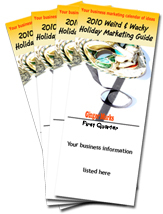 Now available 2010 Weird & Wacky Holiday Marketing Guide, your business calendar of marketing ideas. Order yours today and receive the companion Resource Guide. Listed below are a few of our favorite resources. These sites range from educational to support. We are certain you will find at least one source that you will rely on time and again. By far the best file sharing service available! Never leave home without a document you need. Upload it to Dropbox and instantly you will have access to it from any computer. Share files with clients. You can also send people links to specific files within your Dropbox. This makes Dropbox perfect for team projects. Amber Rosenberg specializes in life coaching for women in relationship, career and life transitions. As a life coach, she will help you break through old barriers and develop new practices so you can reach your desired goals. Keynote Speaker, Lauren E. Miller, offers fun, interactive and highly engaging content and each speaking program is customized to meet your specific goals and initiatives. From small group seminars to large keynote audiences, Lauren delivers impactful programs that anchor positive behavioral shifts. Whether you need one-on-one life coaching or corporate training to help your team relate better with your customers Lauren can and will teach you how. Online classes from basic to advanced levels. Free online classes! Try one today. Instructor led courses are available 24/7. Ever wanted to know how to pronounce a word? Bartleby.com has an audio dictionary link. Try it for yourself. This is a resource we have found useful when we are looking for an interesting quote on a specific topic or by a specific individual.